The Midnight Review: Is This Image Of Obama Photoshopped? I was on Big Government and noticed this image and it caught me as odd. I was wondering if it was photoshopped. Considering where I had gotten it from, I would not doubt it, but it just seemed a little strange - particularly his face. 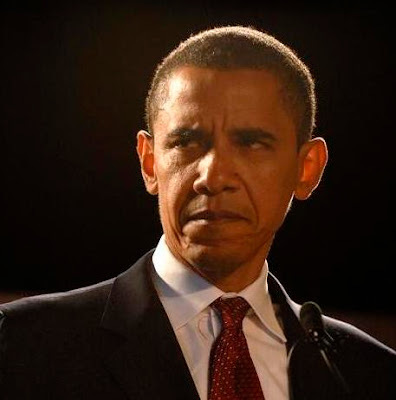 While Obama's body, ears, and hair look pretty sharp, his face, above his chin, between his ears, and beneath his hair line, appear to be rather soft. While I may be mistaken, I just thought this image of Obama looked peculiar. It was accompanied by an article titled "Obama's Transparency Haze" by David A. Keene, which attacks Obama's lack of transparency, or at least lack of conservative approved transparency. While conservatives, such as Keene, trumpet Obama's campaign statements regarding C-SPAN, conservatives balked when Obama invited the Republicans to talk in front of cameras, claiming the meeting to be a trap and a Democratic public relations move. Considering we had a year to discuss the legislation, and its been out there for all to read, I would say that this administration had offered much more transparency then the last, considering the swift passage of The Patriot Act in the wake of September 11th without little debate. Conservatives are unhappy that they didn't contribute to the bill and loss their gambit, and now they are trying to explain their losses in a way that makes them appear to be the victim.